I identify as a second generation ¾ Vietnamese and ¼ Chinese American woman, born and raised in the Chicagoland area. My parents were the first generation to came to the States. My Saigonese dad was one of the hundreds of boat people who fled from the military conscriptions in the 1980s. He almost died escaping Vietnam, since he had little to survive on during his 9-day boat trip to Malaysia. My mom and her family had to constantly go into hiding underground and moved back and forth between her home in Hue and other cities nearby, since the majority of the bombings occurred in Central Vietnam. Somehow, despite all of the near-death experiences both my parents had to face when they were young, they made it. Knowing all of this, I couldn’t be more proud and grateful to be their daughter. Before Project Voice, I was in a near quarter-life crisis in Boston. Having just graduated in spring 2016 from Smith College with a major that I ended up feeling not so passionate about, I ended up jumping from one workplace to another within the average span of 2 to 3 months. Although I had considered starting a podcast when I was taking a digital media production course at Smith, I didn't seriously pursue the idea until I started binge listening to podcast after podcast on iTunes while working as a temp for a digital marketing agency. At that time, I had just quit my first job and had much more time to figure out where I wanted to go next. 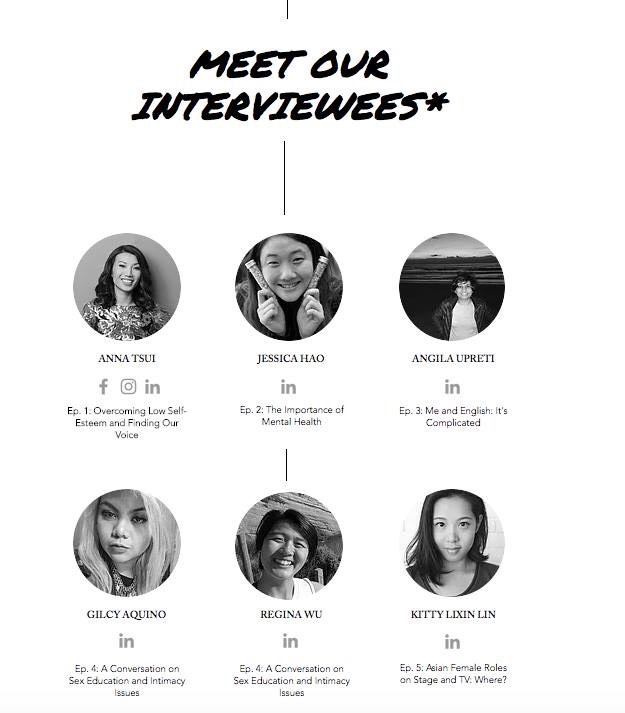 All I knew then was that I wanted to work on a project that would allow me to give back to my community of Asian American women, preferably something that would be able to provide a safe space for us to come together and discuss identity politics and social justice-related issues. So, that's how I got around to starting Project Voice. My interest in social justice wouldn’t have sparked as early if I hadn’t chosen to attend my first college choice, my alma mater, Smith College. After I took some courses, particularly Growing Up Asian American and Introduction to Gender and Women’s Studies, life hasn’t been the same for me. Thought-provoking discussions and readings have equipped me with the ability to express my feelings and experiences about growing up in the States. These discussions exist within my social sphere as well; there was not a week when I didn’t make jokes with my friends about dismantling the white cis-heteropatriarchy. What can I say? I eat, breathe, and live social justice. What is Project Voice? What are its goals, and some of the topics covered? 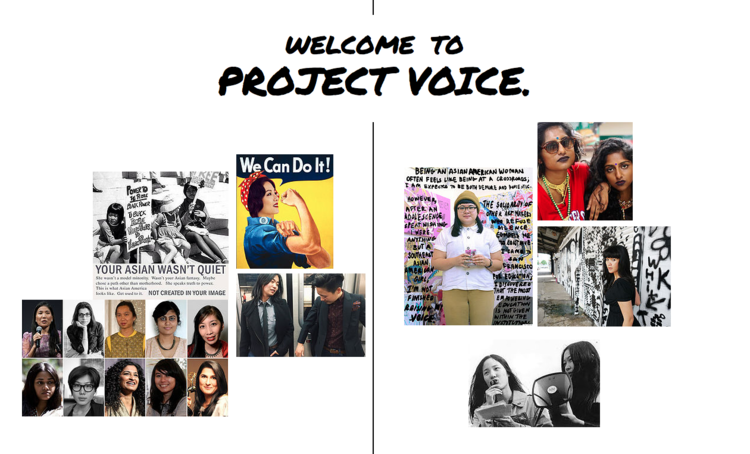 How do you see Project Voice affecting the conversation about Asian and Asian American women? Screenshot of Project Voice website. Spearheaded by the voices of Asian/Asian American women, Project Voice is a podcast series dedicated to increasing visibility on narratives from Asian America. As the host of Project Voice, I hope that this series will act as a digital space where members of our community can go to for guidance and resources. Project Voice is and will always be led by voices of Asian women living the American experience, but that does not mean that this podcast is made to be exclusive. If you identify as an Asian/Asian American man or non-binary, a non-Asian person of color, or a human being who's interested in exploring self-identity, you are more than welcome to listen. Just because you are not part of my group of speakers doesn't mean you can't listen or relate to our stories. As a matter of fact, I encourage people outside the targeted community to listen to Project Voice because it's extremely important for everybody to be socially aware - that's how we create stronger alliances between marginalized people and privileged, white people as well. By being more aware of where others are coming from, you're more likely to listen and empathize with them and resolve issues in a more informed place. In 2017, my goal was to be more conscious about who I would invite to be interviewed on Project Voice. By aiming to diversify my selection of speakers, I was able to deliver a wide range of topics, including non-heteronormative relationships, classist microaggressions, immigration refugeeism, transgender identity politics, disability rights and mental health issues, that acknowledged the intersectionality of other aspects of our identity that take up as much space, if not more, in our lives. Now in 2018, I have made it a new objective of mine to bring in accessibility as this year’s theme. I’m currently putting Project Voice on an open hiatus after its season 3 finale (yay!) to focus more on a transcription project that would allow my podcast to be more accessible to first and foremost, the deaf and hard of hearing community, and then anyone else who finds reading a transcript to be more convenient for them. I’m proud to say that I currently have a team of 9 hard-working and passionate transcribers who are working with me and dedicating their free time to deliver quality, carefully copyedited transcripts for our followers. I hope that more of my listeners will come forth to share their narratives on my podcast (you can reach me on social media or at projectvoiceaaw@gmail.com if you’re interested in being interviewed!). There are still so many topics that have yet to be explored, and the more stories we get out there, the better. If we are not the ones to create our content, then who will? What particular topics are you most passionate or adamant about covering on your show? Do you have a favorite episode? Do you have a dream guest? I’m passionate about covering anything that has to deal with the Asian female diaspora. Truth be told, It’s too difficult for me narrow down one favorite episode, but my interview with Saroeun left the deepest impression on me: I’m Proud to be the Child of Refugee Immigrant Parents. I am adamant about bringing the topic of immigration and refugees into the spotlight as it is still very relevant to our time, especially in this political climate. Like I mentioned before, this year I’ve been very focused on trying to make Project Voice as intersectional of a platform as it can be. I’ve been quite proud of my more recent episode interviews that have been focusing on narratives of marginalized “subcommunities” within our community that do not have as much visibility as other dominating “subcommunities” (i.e., East Asian, straight, able-bodied). I would recommend that you tune into: How to be an Asian/Asian American Activist, A Womxn is Not Defined by Her Body: Transgender and Asian, Diving Deeper into Mental Health Issues, More Blasian Narratives Please! : A Response to the Lack of Non-White Mixed Asian Representation, Not Without, Not Despite: Accept Us for Who We Are WITH our Disabilities, and Normalizing Queerness. At the end of the day, though, I would encourage you to click on episodes that speak to you and that you can gain value out of personally. There are so many dream guests on my list! I have interviewed a good number of them already (all of my interviewees are dream guests, really). One day I would like to interview my mom. Growing up, I saw her as a strong woman and powerful storyteller; I could listen to her all day about her life back in Vietnam and when she first came to the U.S. There’s so much that I wish I can share about her story from her. I’d like to flip the table around and have her share her narrative as a refugee Vietnamese immigrant parent who has had to raise children as a single parent in the States. If I do happen to be able to interview her, what would be even more beautiful would be to do it in Vietnamese, our home language, simply because that’s how we always converse with each other. I would love to have her on the podcast. As a Southeast Asian American woman, do you think there are certain topics that we as a SEA community need to be better at addressing? Definitely. The issue isn’t just about race. It’s the lack of focus on the role of intersectionality in relation to race. First and foremost, we need to focus on being better allies with marginalized communities. For example, we need to take the initiative to educate ourselves and others on how we can prevent Anti-Blackness from spreading within the Asian immigrant community. Secondly, as an Asian American woman, I would encourage my fellow Southeast Asian peers to be aware of the space that we’re taking up as well. Every now and then, we should remember to check our own privileges and not be hesitant to remind others to check theirs as well. I believe that not only should we acknowledge privilege where it exists, but we should also fully utilize it for the sake of empowering and bringing more awareness to those who are less privileged than us when we can. Last but not least, again, don’t be afraid to become your own storytellers. There’s always so much more that we can create and do to elevate our own community. What are some other good podcasts you recommend to others who are interested in learning more about social justice issues affecting Asian and Asian American women? Too many! For podcasts, I would recommend the following for Asian and Asian American women: APEX Express, Sweet & Sour, Books & Boba, and Yellow Face. Definitely, check out the Potluck Podcast Collective. I also used to listen to Two Asian Vaginas and Bullet Train back when they were still active. I’ve been listening to more women of color-oriented Podcasts as well: Slate Represent, 2 Dope Queens, and On She Goes (a travel podcast made for women of color, and my current favorite since I’m a woman of color currently living and traveling abroad!). Whose works are you currently inspired by? Sahra Vang Nguyen has been my role model for the past couple years, ever since I started identifying myself as a digital content creator. What I admire the most about Sahra is that she’s been able to tie in all of her passions as a creator, doing everything from writing and performing spoken poetry to filmmaking (her latest project is called Deported, a 5-part NBC Asian American documentary series that discusses the Cambodian American deportation issue) and managing Lucy’s Vietnamese Kitchen, a Brooklyn-based Vietnamese American restaurant, all while establishing a strong brand that resonates with who she is. She puts her heart and soul into each and every one of her projects and despite how very different each project is from one another, she reminds me that it is possible to do everything you’ve dreamed of doing and make sense of it, if that’s what truly speaks to you. Her philosophy has been what has kept me going. In fact, I have adopted her motto, “Life is not linear,” as my own. Sahra Vang Nguyen is unafraid to speak her truths and that’s what I aim to do in the next few years (so watch out, 2018). I believe that I am speaking some of them, but believe me, there’s still so, so much I want to do and I’m psyched to show everyone what I have in store, not just for Project Voice, but for all the projects that speak to me, Jessica Nguyen, personally. I’m also honored to let you know that I have been invited to be part of a speaker’s panel with Sahra at my alma mater in March 2018. I feel very blessed and excited to be able to share this announcement with everyone. In addition to iTunes, Project Voice is also now available for Android phones as well: SoundCloud, Stitcher, Google Play, Tune In and Spreaker (iHeartRadio).